By Habelt of Wurttemberg, Germany. Size 1A. 1942 dated. Physically measures approximately 41 - 42" pit to pit (laid flat and zipped) with a 27" inside leg. 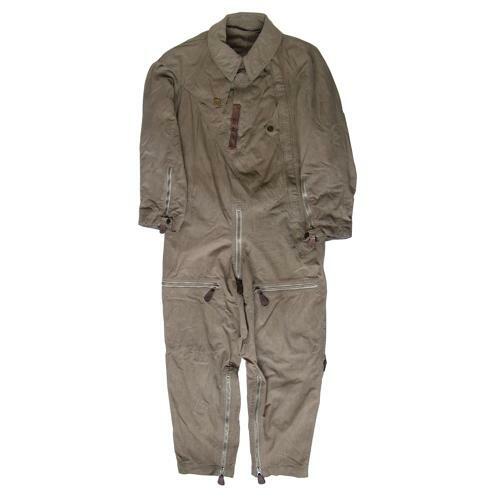 One-piece flying suit manufactured in a heavy brown/white flecked cotton commonly referred to as 'salt and pepper' fabric. Fitted with a long diagonal zip fastener from waist to shoulder and with zips at the sleeve and leg ends. It also features zipped leg pockets and side entry slits along with concealed elasticated inner cuffs. This is a second pattern sommerfliegerkombi and has the later ring-pull emergency release cord that was introduced so that the wearer could remove the suit quickly without the need to undo any zips. It also features a vertically positioned fly zip. Overall condition is excellent. The cloth is really quite clean and aside from a small patch on the right leg and a darn to the back, is undamaged. The inner cuffs have lost elastication. Most of the press stud poppers retain a good amount of original finish and all the zips are original ZIPP brand, complete with leather puller tabs and in good working order (lubrication would be beneficial). The suit retains the original quick release ring pull and cord. Complete with leather collar strap/ring. With manufacturer's and retailer's labels. An excellent display piece. Stock code S23327.